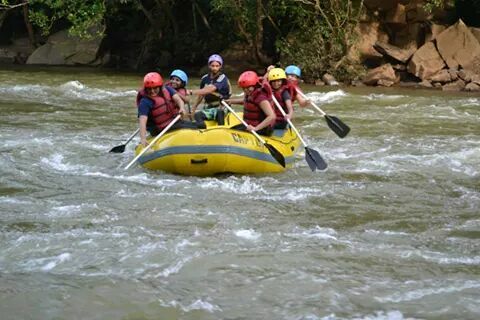 Rafting is the same as boating in an inflatable raft. Since the terrain is a slope, the gravity pulls the water slightly faster. Of course it is safe. When my friend Bhavia told me that she was going on this weekend trip to Chickmagalur with an all women group organized by F5Escapes, I decided to sign up for it as well. They had told us that rafting was an optional activity, so we pay for it separately and that the activity might be cancelled if the river is flooded. And thus, I was a little skeptic when we got into the van that took us to the rafting area. We had a guide named Sunil who had been brought from Manali for his expertise in rafting. We were given life-jackets and a helmet and some initial instructions on how to sit, what command meant what action – forward pedaling, stop, backward pedaling. Right when we started rowing, Sunil splashed water on all of us; was it because he wanted us to get wet and accustomed, or because we were talking about how bored kayaking should be, not noticing he wore kayak as a pendant, I wonder. As we rowed and rested, Sunil told us about his experiences and about the rivers he had rowed in India. During the conversation, a friend Jal suggested to him to not make her get into the waters. Lo! He made just that happen. Pushed her in first. Poor thing, it took her a few minutes to recover and discover that she was back in the raft and everything was alright. Motivated, we all got in. Though, I refused to believe that the life jacket will make us float and that we can’t drown even if we try to – eventually that is what happened. By the time we came to calmer waters again, I was more than eager to get in and float! 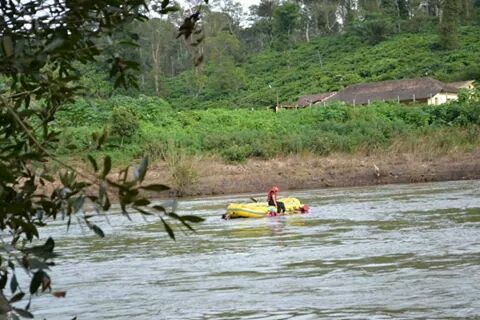 If you check out in Wikipedia or sites on rafting, you will get to know that there are grades given to white water, based on the difficulty; ours was a grade 3 stretch of river, which means there will be smaller waves and drops but it requires considerable maneuvering. Maybe that is why Sunil resorted to other ways to make things interesting. He turned the boat to face the current, and asked us to row forward. I thought I had heard the instruction wrong. Come on, won’t it be against current? But this was right next to a small drop and we were supposed to row to the swiveling water and then the boat will automatically bounce back once we stop rowing (hope you get the picture). It took me a while to figure this pattern out, but we managed to do this successfully in 2 out of 3 attempts! Thanks to F5Escapes for planning and making this trip happen; thanks to Bhavia for pulling me into this; and thanks to the like-minded women who came along and made it memorable. Here goes, ‘paar”vi kalyani… ahem I mean a song in purvi kalyani. Listen and you will understand what I am talking about. Doesn’t this weather warrant something hot? Or stomachs drumming in despair! Composed, tuned and sung by Dev and Vid.